There are many things that we look for in a person when it comes to determining whether or not you have ‘romantic potential’ as a pair, but here’s one thing you may not know to watch for. Have you ever considered the idea that your chosen nail shape may reveal some insight into your personality? The truth is that everything that we do is a result of our personality in some way. Consider your choice in clothing, for example. Do you prefer to dress up at all times, your clothing carefully chosen to portray a responsible image of yourself to the world, or is your focus more on comfort and practicality? Are you a lover of bright, bold colors, or is your wardrobe a vast array of blacks and greys? Every detail is chosen as a response to the way that you think and feel. In the same way, one could take a look at your fingernails and draw some interesting yet accurate conclusions about you and your personality. This includes your overall hygiene (are your nails kept well manicured and clean? 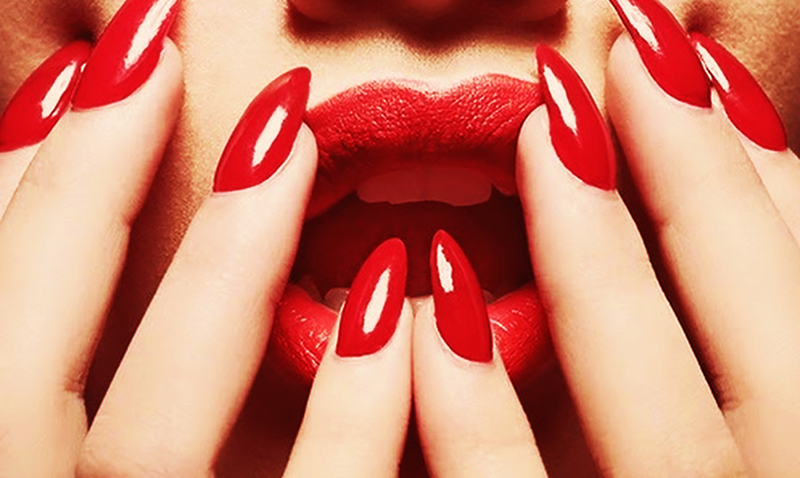 ), the colors you may choose to paint your nails and even the shape that you have your nails cut and filed into. How could your nail shape reflect your personality? There are many considerations that factor into deciding the shape you prefer your nails to take! Are you a hands-on person that needs overly practical nails that won’t hinder your ability to complete your day to day tasks? Are you the kind of person that follows every major trend, making sure you’re always ‘up to date’ when it comes to beauty and fashion? By understanding the reason why you prefer a specific nail shape, we can then predict many elements of your personality, including how you will respond in various situations. We have a glimpse into the ‘real you’. Those who opt to keep their nails rounded are happy-go-lucky people that choose to see the silver lining in every possible situation. When you walk into a room, everyone else lights up simply because they can sense the light that you emit everywhere you go. For this reason, you are highly attractive to others, your personality like a beacon drawing them in, however, you aren’t one to get too serious too quickly. Afraid of the potential of having your heart broken, you choose to instead keep your relationships light and fun. If someone tries to push you to make things serious, you often flee, moving onto the next fling. However, if someone does convince you to open up and trust them, you will love them with everything you’ve got. Highly practical, you have selected a nail shape that will allow you to keep up with anything in your life that may require you to work with your hands, refusing to let something as ‘vain’ as your nails to get in your way. You plan ahead, prepared for anything that life may send your way, which allows you to often come out ahead. When this personality carries over into your relationships, it should come as no surprise that you have no interest in casual hookups or playing games. You want to find ‘the one’ and commit to a stable, happy life together. Unbelievably loyal, you will do anything to protect and care for those that you love, dedicating your time and effort into building a strong, stable relationship. The ‘squoval’ shape of nails is a square nail, however, the edges are rounded off a little providing a softer touch. Like those who prefer the square style, you are practical and prefer to work with your hands, however, you believe that you can be productive without becoming a complete workaholic. When it comes to your relationship, you enjoy flirting and the dating process, getting to know new people and even the occasional short fling. But, when it all comes down to it, you want to find that one perfect match, your soulmate, so that you can settle into a long-term, lasting relationship. Rather than opting for one of the most ‘normal’ nail shapes, you like to mix things up a little with a unique spin. This is similar to your personality, seeking to find your own personal voice. While your nails are a little more ‘fashionable’, they are still practical – a reflection of your easy-going, calm and objective attitude. When it comes to relationships, you are fair, affectionate and loving. You’re not the person that is going to carry out some big grand gesture, but your ongoing support of your partner makes it clear just how much you care each and every day. You are highly in tune with your partner’s emotions, your compassionate personality ensuring that you take the time to make sure they feel happy and loved every day. Another ‘unique’ nail shape, the coffin shape is one of the newer and trendier styles that we see today. This is a clear indication that fashion and trends are incredibly important to you. You hate the idea of conforming to society’s expectations, after all, how much fun would that be? Instead, you go through life seeking any opportunity to add a little fun and excitement into your life. You choose to approach relationships in the same way, focusing on keeping the ‘love’ alive regardless of how long you may be together. This helps you to maintain a happy, healthy relationship years after years, the kind of relationship that others look up to. Far from practical, those who choose to have stiletto nails aren’t too worried about working with your hands. Instead, you prioritize fashion and style in your life, eager to always be on top of the ‘latest and greatest’. While this can give others the opinion that you are vain and self-centered, this couldn’t be any further from the truth. Instead, you are a creative person who often lives in your own dream world. You are emotional, spiritual and incredibly compassionate. Unfortunately, you often wind up with your head so lost in the clouds that you lose touch with reality, which is why you fail to see the practical side of this decision. You live with your heart on your sleeve. Growing up, you would daydream about finding your prince charming, which led to the incredible romantic that you are today.